James Shields helps keep Boston scoreless for Chicago. Chicago White Sox shortstop Tim Anderson (7) slides safely into second base after hitting a double as Boston Red Sox second baseman Ian Kinsler applies a late tag during the sixth inning Sunday in Chicago. CHICAGO (AP) — Boston’s rotation woes continued. And the rebuilding Chicago White Sox took full advantage. Anderson had three hits – including two doubles – for the White Sox, who have won seven of their last 10 games. 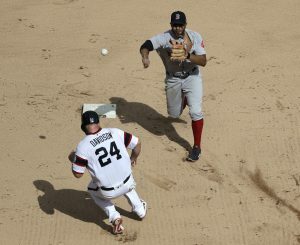 Boston Red Sox shortstop Xander Bogaerts, top, throws to first after forcing out Chicago’s Matt Davidson at second during the sixth inning Sunday in Chicago. Xander Bogaerts and J.D. Martinez had two hits apiece for Boston, which had won four of its last five. The Red Sox have the majors’ best record at 94-44 and maintained a 7 1/2-game lead in the AL East over the New York Yankees, who lost to Detroit. With Chris Sale and David Price out with injuries, the Red Sox have just two quality starts in their last 17 games. Their starting pitchers combined to allow 12 earned runs in 14 innings in the series. “We’re going to be fine,” manager Alex Cora said. “When you start getting hurt, especially your main guys, it’s not easy to go out there with the guys that we’re throwing and keep throwing the ball well. Shields (6-15) struck out six and allowed four hits and two walks. He has thrown at least six innings in 21 of his last 25 starts. Three relievers completed the five-hitter. Five Red Sox pitchers combined to strike out 12 but gave up 15 hits. “We have the right guys in the bullpen to help us out as far as innings and all that, and I think it’s going to turn around because of that,” Cora said. Brian Johnson (4-4) allowed four runs and seven hits while recording four outs in his shortest start of the season. Anderson hit his 18th home run this season on the first pitch with one out in the first inning. Kevan Smith’s single added another run. Matt Davidson’s two-run double chased Johnson in the second. The White Sox extended their lead to 5-0 on Adam Engel’s single off Bobby Poyner in the third inning. Palka smacked his 20th home run in the fourth off William Cuevas – four pitches after he hit a long drive just foul and completed a jog around the bases before heading back to the plate. “It was funny because the bat boy went to give me a high-five and I was like, ‘Just give me the bat,”‘ Palka said. In a pregame ceremony, the White Sox honored TV play-by-play announcer Ken “Hawk” Harrelson, who is concluding his 34th and final year in the booth. Harrelson played nine seasons in the majors with four teams and rose to stardom in 1967, when he helped the Red Sox win the AL pennant. The following season, he led the majors with 109 RBIs and finished third in AL MVP voting. He became a broadcaster in 1975 with the Red Sox and served a season as the White Sox general manager. Harrelson made no apologies for his ardent support for his team. “The biggest compliment you can pay me is calling me a homer because I want these guys to win every game,” he said. The White Sox won four of seven games against Boston this season. “The second half has just been a whole different team – same guys, things are just clicking more consistently,” Palka said. Red Sox: LHPs Sale (mild inflammation in left shoulder) and Price (bruised left wrist) could return to the rotation as early as next weekend, Cora said. For both starters, the Red Sox are looking at their next homestand, which begins Friday with three games against Houston before three games against Toronto and three against the Mets. Sale, who has been on the DL since Aug. 15, could pitch a few innings as an “opener” as he builds up his stamina, Cora said. Sale is 12-4 with an AL-leading 1.97 ERA. “It’s going to be during the homestand, but we don’t know which series,” Cora said. … The Red Sox hope Price (14-6, 3.60 ERA) also will be able to throw off a mound this week in Atlanta as he works his way back. A line drive struck his pitching wrist against Miami on Wednesday. “It should be Houston or the next series,” Cora said. … Cuevas (heat-related illness) exited after allowing two runs and recording eight outs. The temperature at first pitch was 87 degrees. White Sox: C Welington Castillo (right shoulder) was activated from the 10-day disabled list Sunday and is expected to start Monday against Detroit. He was suspended for 80 games May 24 after he tested positive for a performance-enhancing substance. … RF Ryan LaMarre (right hip soreness) exited after six innings. He is day to day. … RF Avisail Garcia (right knee soreness) was out of the lineup Sunday after he left Saturday’s game after six innings.